The Devon Heartland Way 43 miles of pastoral countryside with the profile of Dartmoor in the background and fairly easy walking, but a couple of steady climbs. This waymarked route links Okehampton with the Exe Valley. The Devon Heartland Way starts at Okehampton Station which is handy. Here we are on the edge of mysterious Dartmoor. The trail follows the valley of the East Okement river and crosses peaceful countryside. 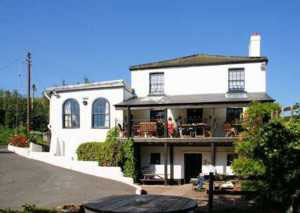 The odd house or two but the first place we come to is pretty Sampford Courtenay – cameras at the ready. Here in 1549 the rising in the west of England against the new English Prayer Book and the then new fangled religious policies of Edward VI, ended. Well there was another small stand at Launceston, but it was more or less over. A history of the rebellion is on view in St Andrews Church. A plaque remembers William Helyons who was killed on the steps of the Church House. The village has a station on the Dartmoor Railway. Once the beautiful village of Honeychurch has been passed we cross the Taw to get to its namesake North Tawton, home of Ted Hughes, the poet, Jam & Jerusalem and William Budd who discovered that typhoid was spread in contaminated water. 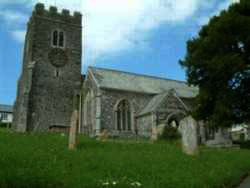 In Jam & Jerusalem, North Tawton was Clatterford St Mary in a sitcom about a Women's Guild by Jennifer Saunders. Scenes from the town can be spotted and some of the local folk were extras. From North Tawton we make our way along the Devon Heartland Way to Colebrook through Ashridge and Zeal Monachorum, a little village on a hillside overlooking the Yeo valley. The origin of the name Zeal Monachorum is very debatable, some say it means 'cell of the monks'. King Cnut gave the manor to Buckfast Abbey in 1018. The Devonshire Association of Bellringers was founded here in 1924 and the bellringers of Zeal Monachorum have been very successful over the years. Between 1967 and 1990 they were not ringing as the tower was unsafe. Renovation completed and the group began again. Another restoration was completed in 2007 and the bells were rededicated. 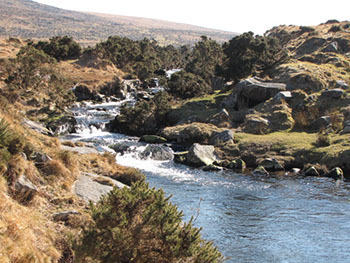 The Devon Heartland Way follows the Yeo for a while and then the smaller streams until we reach Colebrook. Uncle Tom Cobley of the well known song “Widdicombe Fair” was a real person and it was in Colebrook that he signed his will, although he is buried and possibly lived in Spreyton. It was here in Colebrook and also Australia that Henry Kingsley, brother of the better known, Charles Kingsley, set his novel, “Recollections of Geoffrey Hamlyn”, in 1859. A famous son of Colebrook was the wrestler of the 1800's, Abraham Cann who would fight any man in England for five hundred pounds! He was Champion of Devonshire and won the all comers wrestling crown in London. He fought in the Devonshire style with boots and shoes and kicking in the legs. He is buried in Colebrook Churchyard. To the east of Colebrook there is a site of a Roman fort. From here to Crediton walking along the Devon Heartland Way is fairly level and follows along the Yeo valley. Yeoford is the next village. Straddling out on both sides of the Tarka railway line this quiet, pretty village has old buildings that date back to the sixteenth century. 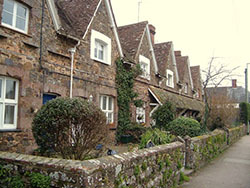 The part of the village to the north of the line has been designated a Conservation area. © Copyright Graeme Churchard and licensed for reuse under this Creative Commons Licence. Now the path diverts to pass Posbury Clump,once a quarry now a Site of special Specific Interest. These Igneous rocks are ancient rocks of the Devonian to Permian age and are protected. 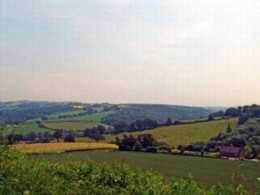 Posbury Clump may have been a site of a battleground between the Celts and Saxons in the middle of the seventh century. Back on track The Devon Heartland Way makes its way to the attractive Saxon town of Crediton. The Church of the Holy Cross an impressive large red sandstone building. 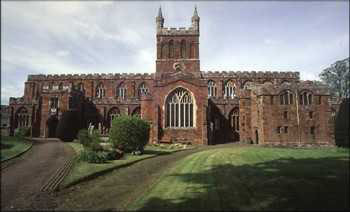 Despite the building of a cathedral at Exeter in 1050, Crediton still has its own Bishop. The patron saint of both Germany and Holland, St Boniface, was born, Winfrith, in Crediton in 680AD. General Sir Redvers Buller, known as the people's general, who led the relief of Mafeking was a resident of Crediton. Crediton s named for its river – the Creedy. Stop for a break here, Crediton is known for its fresh organic food, some say the best in Europe. There are several dairies and creameries open to the public and if you are passing through on the first Saturday of the month there is a Farmers Market. Refreshed we move on the Devon Heartland Way once again on more or less level ground through not too difficult terrain. Some hill climbs are rewarded with wonderful views. The route now goes to historic Shobroke Park, once known as Little Fulford. Sir William Peryam, one of the judges of Mary Queen of Scots, built a manor house here. His tomb is in The Church of the Holy Cross at Crediton. The house was burned down in 1945 but the garden is being lovingly restored as it was when first laid out by Henry Hippisley Tuckfield in about 1845. 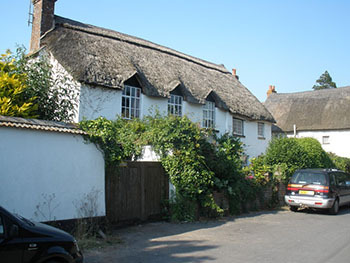 An aside – Shobroke village itself is said to be in 'the 'heart of cob country'. Here the village under the auspices of the Parochial Church Council got a Heritage Lottery Fund grant to restore the churchyard wall. This wall is considered to be an excellent example of cob construction. Although of course there had to be a contractor, villagers too got involved. Many of their own houses are constructed of cob and thatch. Cob is an ancient art of building using a soil, straw and water mixture. Old houses throughout England are built this way and have stood the ravages of centuries. Back to the Devon Heartland Way and we now follow the Creedy river. The name probably means winding – and it does. It is actually a tributary of the River Exe. Newton St Cyres has its own brewery at the Beer Engine right next to the station. It was at one time the Railway Hotel, but now is a pub and brews its own real ale. The Quicke family have been in Newton St Cyres since the 1500's. Now they make traditional Cheddar Cheese which can be purchased at their farm shop on your way through. With the real ale – seems to be the making of a great Ploughman's lunch. First Great Western runs a railway through Newton St Cyres, might be a good day trip! Pop over the hump back pedestrian bridge for a lovely photo opportunity in Pump Street with its beautiful thatched cottages. The Devon Heartland Way now climbs over a low ridge between the Creedy and the Exe and through Upton Pyne. The village was named for the Pyne family who arrived here in the eleventh century. Their name is also commemorated in the villages of Culm Pyne and Washford Pyne. The present Pynes House was probably built by Sir Henry Northcote who married a member of the Pyne family in the 1700's. The house was enlarged about 150 years later. From the church views that may not have changed much since the Bronze Age, look out over to the hills of Raddon, Cadbury and Christ Cross and are another photo opportunity, perhaps a movie camera prospect. The very attractive church of St Mary itself is built of volcanic stone, the tower being particularly lovely with its four evangelists at the corners and of Christ in Benediction on the West face. For the horse riders among you there is an Equestrian Centre in Upton Pyne. From Upton Pyne the Devon Heartland Way travels in the direction of Brampford Speke on the River Exe. A most attractive place of cob and thatch dating from the 1500's. The name probably means a ford with brambles. The Speke part comes from the Espeke family who came here in the eleventh century as lords of the manor. A Site of Special Scientific Interest two kilometres long lies immediately to the east of Brampford Speke and is of course protected. It consists of two types of meandering floodplain. In this locality the River Exe is wide and very deep and gets pretty dangerous in a flood. The War Memorial is unusual and is in two parts. One is in the church and is of pink marble with a white marble sheet mounted on top on which the names are carved. We cross the Exe at Brampford Speke and follow along an old railway line to Stoke Canon. 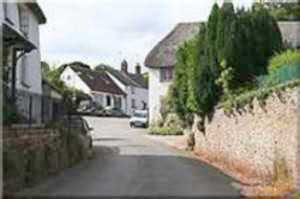 This small village lies near where the Culm River meets the Exe and is the end of the Devon Heartland Way. Stoke Canon itself has a church that is said to be the earliest in Devon, but it was rebuilt in 1861. There is a lava font with an odd history. In 1824 the church floor was repaired and it was discovered that the font was upside down. It was found that the lower part had carving on it and was the original font and so was replaced in its correct position. Stoke Canon bridge over the River Culm goes back to the 13th century and some of that work still remains even though the bridge has been widened to carry modern traffic. The Devon Heartland Way need not be walked all in one go. It is a nice idea to make a short break of it and stay somewhere on the way.